Monster Hunter: World has been out for less than a week, but it appears that it's already pretty popular around the globe. Certainly there are a few of us on staff that have been enjoying our time in the New World tracking and bringing down Anjanaths, Pukei-Pukeis, and Barroths. If you're out there, too, having fun "hunning mons" with your friends, then Capcom's got a treat in store for you next month: free Street Fighter V costume DLC. Like any good third-person action titles these days, the in-game action is all but secondary to the real showstopper: fashion. Taking down a Great Jagras may be walk in the park, but you'll keep doing it until you get all the pieces necessary to craft that one piece of gear that perfectly accompanies the rest of your ensemble crafted from the parts of various monsters. If you're only interested in armor for its stats and don't really like the way any of it looks, then perhaps you'd like to run around swinging a Great Sword as Ryu? 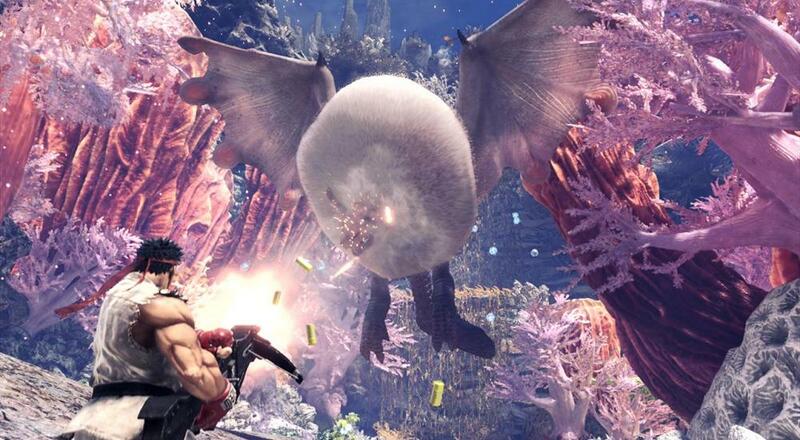 Beginning around the middle of this month, a new Event Quest will be added to the list that will task players with bringing down a Barroth (aka, the "Choo-Choo Train"). Successfully completing the Event Quest will reward players with a full armor set that transforms your hunter into the legendary Street Fighter. Players with a Street Fighter V or Street Fighter V: Arcade Edition save on their system will get Early Access to the quest. At a later date, a new Event Quest will be added that will reward players with a Sakura armor set should they wish to tackle the monsters in the New World as the true heroine of Street Fighter. You can check the Monster Hunter: World Event Schedule on their website for more details on this and future Event Quests as they become available.